Ever wondered how to make honeycomb? 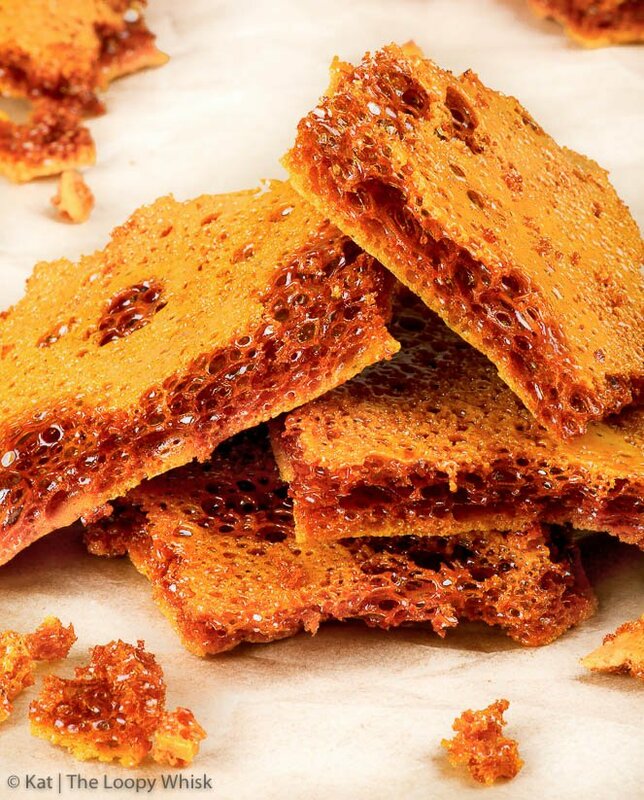 Well, wonder no more – this quick and easy recipe for homemade honeycomb candy requires only 4 ingredients and 10 minutes! 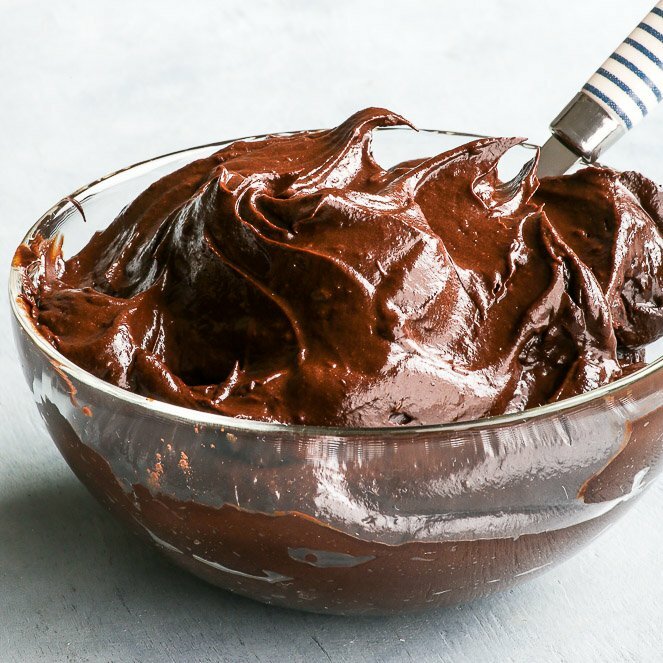 This delicious candy is gluten, dairy, egg, soy and nut free, and the recipe also has a vegan option. This one will be short and sweet. 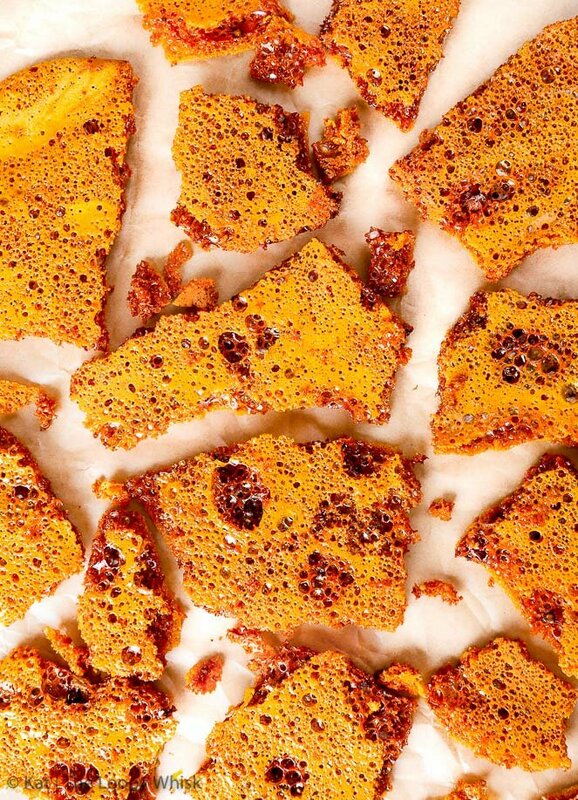 Very sweet, as it happens – because this post is all about how to make honeycomb. 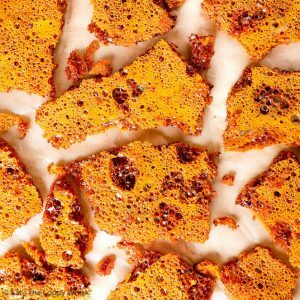 Sometimes also called honeycomb toffee or hokey-pokey (try saying that three times and see if you don’t end up smiling like a crazy person), it’s a crispy candy that’s all bubbles and caramelised sugar and crunch and just… fun. 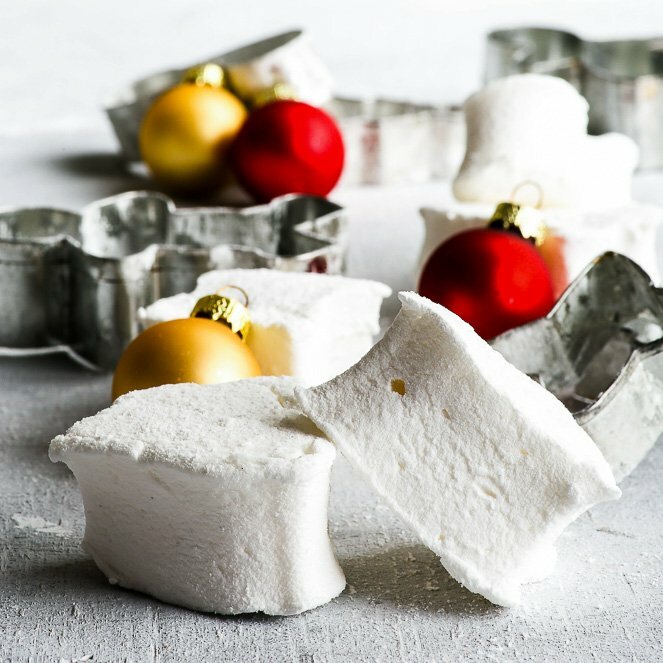 You can have it on its own as a sweet treat or dipped in chocolate if you’re feeling extra indulgent – and it makes a wonderful homemade gift. With its warm golden colour, shiny surface and crazy bubble patterns, it’s perfect for decorating cakes and cupcakes, elevating them from “pretty” all the way to “super-elegant-and-impressive-and-everyone-is-totally-jealous-of-your-baking-skills”. When you think about how to make honeycomb, you might expect the process to be highly complicated and several-hours-long. Nope, not at all. 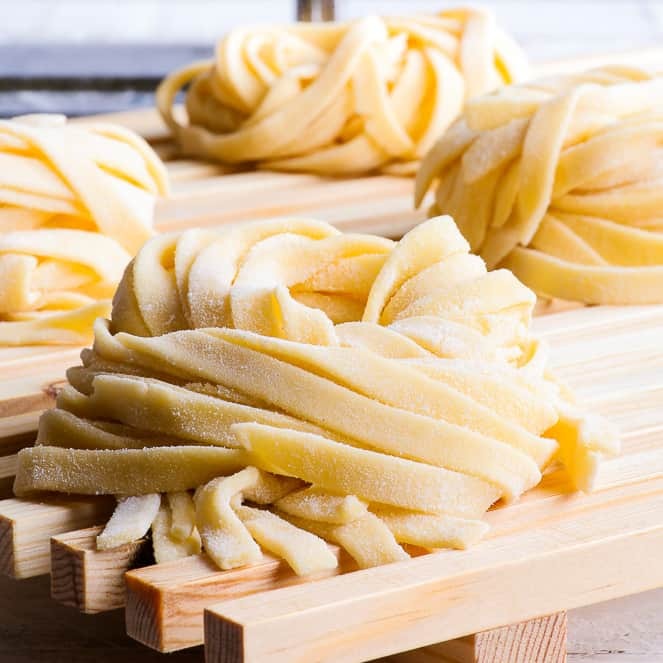 A few minutes, 4 ingredients and you’re all set. 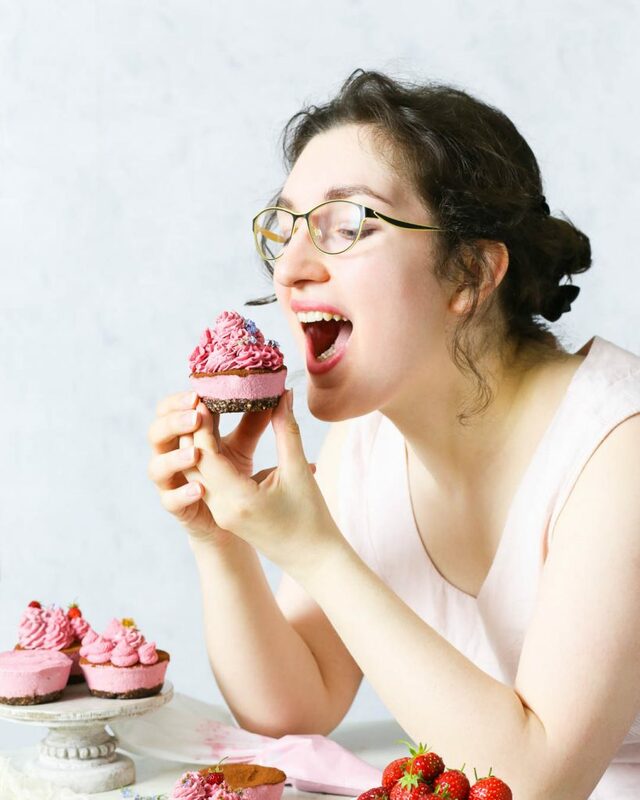 Even if you’re a total baking beginner and you don’t know your macarons from your macaroons (to be fair, I still get them confused every now and then), you can totally do this – with all the flair and elegance of a Michelin star chef. Bonus points if you can get a minion to shout “Oui Chef!” at you every five minutes. P.S. I was good and measured the ingredients both in cups and in grams. Enjoy it while it lasts. Ever wondered how to make honeycomb? Well, wonder no more – this quick and easy recipe for homemade honeycomb candy requires only 4 ingredients and 10 minutes! 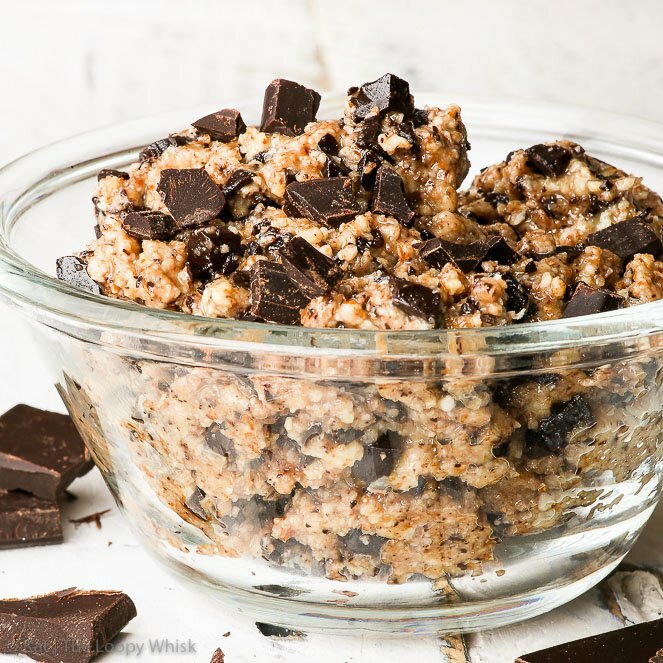 This delicious candy is gluten, dairy, egg, soy and nut free, and the recipe also has a vegan option. NOTE: This recipe gives one 9 x 12 inch sheet of honeycomb. Sift the bicarbonate of soda. In a large pot, heat the sugar, honey (or golden syrup) and salt until the mixture reaches 295 ºF (145 ºC), stirring it with a spatula to ensure even caramelisation. The mixture will turn a deep golden colour. Turn off the heat and immediately mix in the bicarbonate of soda. The mixture will bubble/foam quite a bit. Continue stirring the mixture until the bicarbonate of soda is completely dissolved. Pour the honeycomb mixture onto the prepared baking tray. Allow the honeycomb to cool completely before breaking it up and storing it in an airtight container. Looking for more baking how to’s? 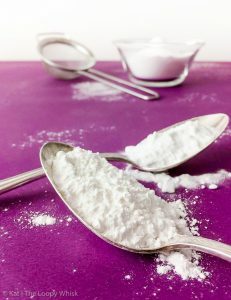 Check out how to make aluminium-free homemade baking powder!